Official Records, Series 1, Volume 51, part 2, p. 304. 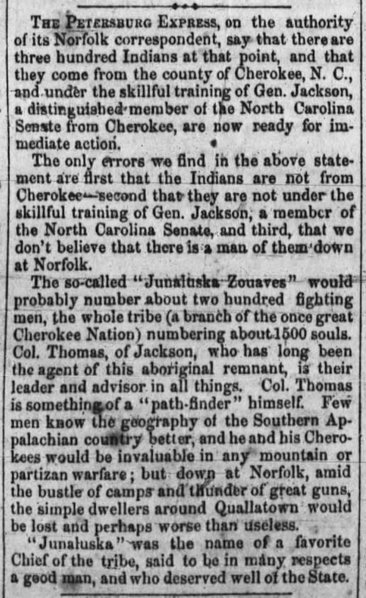 On September 15, 1861, William Holland Thomas had organized 200 Cherokee Indians into a local defense force known as the "Junaluska Zouaves." Initially mustered into state service during the Civil War (1861-1865), this formation was named in honor of Cherokee Chief Junaluska. On April 9, 1862, the 200-man Indian command was mustered into Confederate service as Companies A & B of the “North Carolina Cherokee Battalion” at Qualla Town, North Carolina, with Thomas being elected as Captain of Company A and later as Major of the Battalion. From April to September 1862, the battalion was engaged in home guard duty in the mountains of Tennessee and North Carolina. 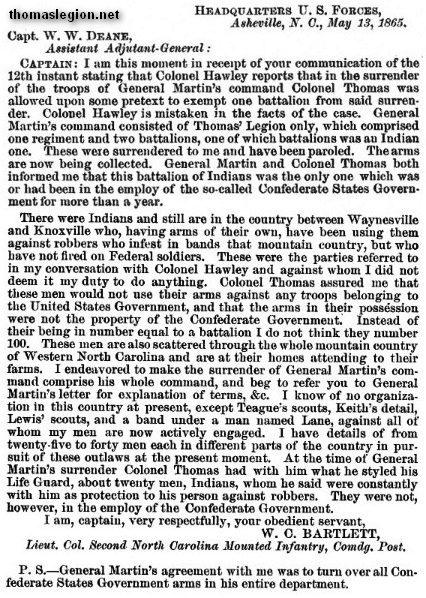 Whereas the unit was ordered into East Tennessee in September 1862, Major Thomas would request and obtain permission from the Confederate government to recruit additional “Indians and whites as I may select.” As a result, Thomas organized seven companies which he designated as “Thomas’ Legion of Indians & Highlanders.” The organization now consisted of two Indian Companies and five white companies (two of which were designated as Walker’s Battalion under Captain William C. Walker). On September 27, 1862, the regiment was officially mustered into Confederate States service as “Thomas’ Legion” (also known as the 69th North Carolina Volunteer Infantry Regiment) at Knoxville, with William H. Thomas as Colonel, James R. Love as Lieutenant Colonel, and William W. Stringfield as Major of the Regiment. The regiment consisted of ten companies, eight white and two Indian. In the regimental organization, the Junaluska Zouaves became companies C & D, but in January 1863 they were re-designated as Companies A & B of the Indian Battalion of the Legion. Thomas would organize his third Cherokee company in December 1863 and the fourth and final company during the summer of 1864. From September 1862 to May 1865, the Indian Battalion would operate as a local defense force and perform provost duties while in the shared mountains of Old Carolina and Tennessee. Meanwhile, Walker's Battalion, which would later be known as "First Battalion," completed its organization on October 1, 1862, at Knoxville, with Lieutenant Colonel William C. Walker, commanding. The Thomas Legion added its light artillery battery on April 1, 1863, and now consisted of one regiment, two battalions, one artillery battery, and two companies of miners and sappers, known as the Pioneer Companies. Although Colonel Thomas would employ bodyguards, what he referred to as the "Life Guard," for his personal defense, the 20 Cherokee Indians of this contingent were never considered in service of the Confederacy. Thomas would increase the Indian companies and conclude his recruitment of the Cherokee Battalion, 400 soldiers, in early 1865 and merely months before the fighting had ceased. The Indian Battalion was present with Thomas when he formally surrendered the Thomas Legion on May 9, 1865, at Waynesville, North Carolina. (Left) Official Union report discussing details of the Thomas Legion surrender. (Right) Account of the Indians comprising what was initially called the Junaluska Zouaves, the nom de guerre assigned to the Cherokee Battalion of Thomas' Legion. Newbern Daily Progress (New Bern, North Carolina), 20 May 1861, Mon. Page 2. On September 15, 1861, two Cherokee companies (200 warriors) loyally answered the call to arms during the American Civil War (1861-1865). Although these 200 Indians were originally known as the "Junaluska Zouaves," in honor of Chief Junaluska, William Holland Thomas, its commanding officer, also referred to them as the North Carolina Cherokee Battalion (O.R., Series 1, 51, II, p. 304* and O.R., 1, 49, pt. II, p. 754). By the end of the Civil War, a conflict that would claim some 620,000 Americans, muster records show that almost every able-bodied Cherokee, 400 Indians serving in 4 companies, from Western North Carolina had entered into Confederate military service. According to O.R., Series 1, 53, p. 314, Thomas stated that the Cherokee Indians didn't own any slaves, so slavery was not a motive for their involvement in the conflict. (About) Cherokee Battalion was instrumental in forcing the Union command to negotiate and accept the Thomas Legion surrender terms. The Cherokee Indians had entered the Civil War in spectacular fashion and their exit would be one of the most fascinating capitulations in the annals of warfare. Has an enemy ever captured a town to afterwards immediately capitulate? The Indians of the Thomas Legion would prove to be invaluable during the capture of a Union held town in order to parlay with a U.S. Army commander and then surrender on the best possible terms in recent military history. Nearly one month after Lee had surrendered to Grant in Virginia, the Thomas Legion was still on the warpath while remaining relentless toward the foe. If the Federals didn't accept his terms, Colonel Thomas said to his adversary, one Lt. Col. Bartlett, then I will unleash the Indians on a scalping melee in your command. Bartlett, nevertheless, would keep his scalp while the Thomas Legion disbanded and the men returned to their homes for what many in neighboring East Tennessee would call, not Reconstruction, but Uncivil War. Whereas President Jefferson Davis believed that the Cherokee Indians should be used to defend the "coast and swamps of North Carolina" (O.R. Series 1, 51, II, p. 304. September 19, 1861), this was contrary to Thomas' Civil War Strategy. With Thomas’ persuasion, however, the warriors were not assigned to the Old North State's swamps. The Coastal Region was the first of the state's three regions to capitulate, which allowed longer imprisonment for the captured Confederates and therefore greater exposure to the numerous diseases at the POW Camps. The greatest threat to these Indians, which had never ventured beyond the rugged mountains of the Tar Heel State, would have been the immediate exposure to the disease infested swamps. The Indians would remain with Colonel Thomas in the western portion of Old Carolina and operate as a local defense force and perform provost duties. On a few occasions the command would push into East Tennessee and engage the larger Union force before returning to North Carolina. It was reported by some newspapers, that the Cherokee were the best scouts and could track and round up from deserters to escaped Union prisoners. Always outnumbered, but never outperformed are just some of the words that can be best used to describe the loyal Indians of the Thomas Legion. Lest he be grieved, Chief Yonaguska commanded the Eastern Cherokee to obey William H. Thomas. These Indians were also considered superstitious as well as spiritual, so, according to custom, their Cherokee loyalty would remain steadfast with Thomas for the duration of the war. Not disloyalty, nor combat, but mumps and measles would cause the greatest loss of life in the Cherokee ranks during the conflict. And after the war, smallpox would be responsible for killing more than one hundred members of the tribe. (Letter about smallpox by Thomas.) During the fight their obedience would be tested by the Union promise of liberty and five thousand dollars in gold if they would bring in the scalp of their leader, one William H. Thomas. See also The Cherokee Battalion: Skirmishes and Battles and William Holland Thomas' 20 Cherokee Bodyguard. According to Neely, North Carolina's Eastern Band of Cherokees, p. 162, "Some Cherokees desired neutrality while as many as 30 joined the Union Army." Oral history states that many of the disloyal Cherokees were later murdered by their relatives because they had betrayed Thomas, as well as Yonaguska. The Cherokee Indians who graced the ranks of the Union Army would fight against their brothers and then be credited for returning to Western North Carolina with the dreaded killer called smallpox. It must also be stated that captured Confederate Cherokees were held in Federal prisoner of war camps. Postwar, these paroled Indians could have also returned to Western North Carolina as carriers of the dreaded disease. With the intentional use of smallpox in any given conflict considered biological warfare, today it is also classified as a Weapon of Mass Destruction, or more commonly, a WMD. Meet The Author: A resident of Carthage, Missouri, Steve Cottrell is a descendant of a Sixth Kansas Cavalry member who served in the Indian Territory during the Civil War. A graduate of Missouri Southern State College in Joplin, Cottrell has participated in several battle reenactments including the Academy Award winning motion picture, "Glory". Active in Civil War battlefield preservation and historical monument projects and contributor of a number of Civil War relics to regional museums, Cottrell recently co-authored Civil War in the Ozarks, also by Pelican. It is now in its second printing. Additional Sources: Official Records of the Union and Confederate Armies; Vernon H. Crow, Storm in the Mountains: Thomas' Confederate Legion of Cherokee Indians and Mountaineers; Walter Clark, Histories of the Several Regiments and Battalions from North Carolina in the Great War 1861-1865; National Park Service: American Civil War; National Park Service: Soldiers and Sailors System; Weymouth T. Jordan and Louis H. Manarin, North Carolina Troops, 1861-1865; D. H. Hill, Confederate Military History Of North Carolina: North Carolina In The Civil War, 1861-1865; Christopher M. Watford, The Civil War in North Carolina: Soldiers' and Civilians' Letters and Diaries, 1861-1865. Volume 2: The Mountains; William F. Fox, Regimental Losses in the American Civil War.